The blueprints look at typical configurations that help you understand how you can deploy StoreVirtual. Each one is centered around a customer challenge, an example configuration, a high level diagram a list of suggested software and hardware, and recommendations for expanding or modifying the solution. Blueprint #1 compares traditional data storage with SDS technology. Includes definition of virtual storage appliance (VSA), basic features and benefits, and environments for deployment. Blueprint #2 describes the challenges of traditional IT infrastructures, and shows how SDS addresses these challenges. Blueprint #3 explores the limitations of physical storage systems and storage siloes. Blueprint #4 addresses unpredictable workloads and investment protection in mixed-vendor IT environments. 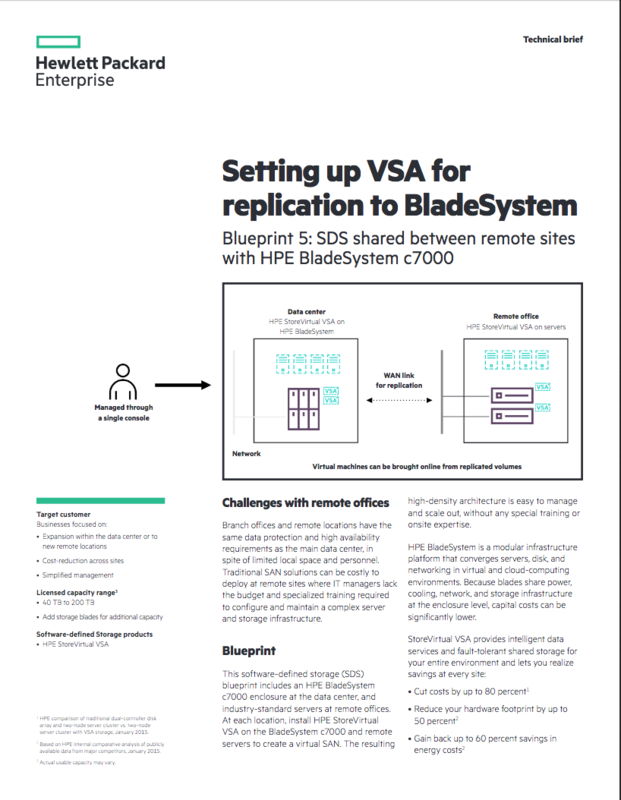 Blueprint #5 includes an HPE BladeSystem c7000 enclosure at the data center, and StoreVirtual VSA installed on industry-standard servers at remote offices. Blueprint #6 shows a cost-effective, simple configuration for small to midsize businesses looking to deploy SDS at remote sites with HPE StoreVirtual 4335 Hybrid Storage Systems at the main office. Blueprint #7 describes open-platform storage solutions comprised of HPE Hyper Converged appliances and StoreVirtual VSA.